Bright Smile dental clinic provides a range of non-surgical facial rejuvenation beauty treatments provided by our expert Dr. Massoudi. Please take a look at our “Before & After” gallery for examples of Dr. Massoudi’s work. Bright Smile dental clinic specialise in a wide range of facial rejunevation treatments including anti-wrinkle injections (Botox), and dermal fillers starting from £200. Consultations with Dr. Massoudi take place at our modern clinic and are free to help you decide what treatments are best for you. We are located on Finchley Road NW3, very close to Finchley Road tube station. Please call us (02074311444) or use this link to book a free consultation. 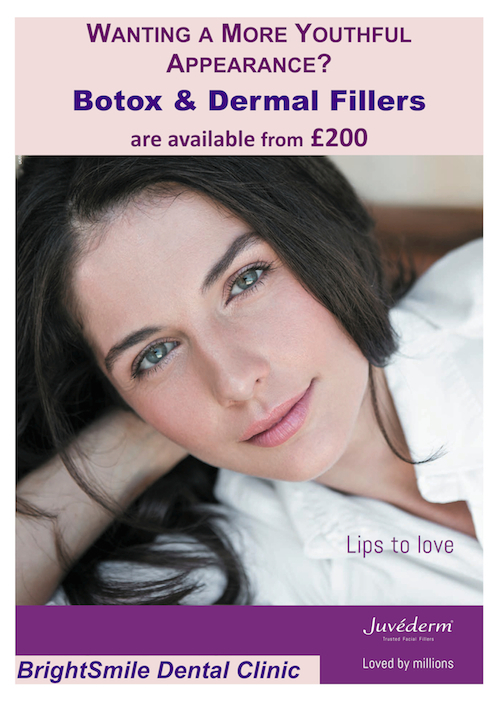 Facial Rejuvenation Offers for Dermal Filler & Botox. Receive a 10% discount for a single treatment, and a 15% discount for multiple treatments. If you are interested in this promotion offered by us, then simply call us on 02074311444 or book a free consultation at our NW3 (Finchley Road) dental clinic. Our friendly and highly skilled dentists and cosmetic consultant are here to help you. Offer ends on December 20, 2013.